A super fragrant spicy blend of tart cranberries and hints of cinnamon, cardamom, nutmeg and clove. Scented candle in the box "Spiced cranberry"
A holiday classic where delicious bakery scent is mixed with aromatic spices. Scented candle in the box "Gingerbread"
A romantic, luxurious and intoxicating mix of strawberries, hyacinth, cassis, white flowers and sandalwood blended with lily of the valley and apple cider. 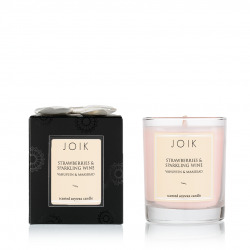 Scented candle in the box "Strawberries and wine"
A sofisticated blend of delicious fruity aromas blended into a fresh and clean, yet complex fragrance. Scented candle in the box "Mandarin"
A sofisticated blend of delicious fruity aromas blended into a fresh and clean, yet complex fragrance. A sofisticated blend of delicious fruity aromas blended into a fresh and clean, yet complex fragrance. Scented candle in the box "Oh, Christmas tree"
Sweet, tender, airy and overwhelming - like falling in love - this is what the scent of Chérie reminds of. Scented candle in the box "Cherie"
A fresh and juicy blend of forest fruits of blackberry, bilberry, raspberry and tart cranberry is veiled with a sultry hint of vanilla. Scented candle in the box "Wild berry sorbet"
A juicy and tart combination of blueberries, raspberries, blackberries and cranberries is veiled with a smooth vanilla frosting. Smells like delicious berry dessert. A true and intensely fragrant classic rose scent - feminine and romantic. A delicious blend of aromatic coffee with spicy cinnamon, creamy vanilla and sweet caramel. A delicious and comforting aroma of fresh cinnamon buns covered with vanilla frosting. A beautyful blend of lavender, vanilla, coconut milk and musk. Scented candle in the box "Fresh"
A juicy and youthful fragrance combination of fresh apples, citrus and a sophisticated blend of exotic flowers, musk and woods. 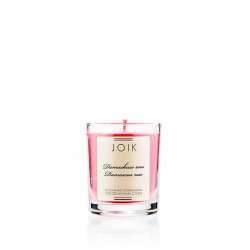 Scented candle in the box "Vanille et noisette"
Scented candle in the red box "La Boheme"
A sophisticated blend of musk, oriental spices, carnation, jasmine and vanilla is truly enchanting and inspiring. 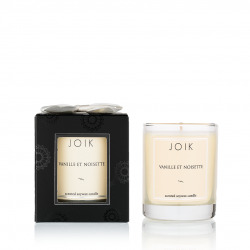 A sultry and very fragrant raspberry scent in a unique setting of mild spices, white tea and florals. A fresh and gentle aroma of spring flowers gently veiled by citrus notes resting on a base of precious woods and a hint of fruit! An unscented version of our soywax candles. A fresh and airy romantic scent where fruity apricots meet tender freesias. A delicious sweet scent like the dessert in the finest restaurants.